The saxophone and organ combination was very popular at the time of these recordings particularly in the United States, they not quite sop relevant in the UK and were confined mostly to R & B groups. Gene Ammons is a master of this type of jazz and his tenor sound fits neatly into the genre. Brother Jack McDuff is very much in the Jimmy Smith groove and was very popular at the time but would seem to be the sound of a bygone era. Tracks 1 to 6 on CD One have the added presence of Count Basie trumpeter Joe Newman which adds a degree of contrast to the tenor / organ pairing. Many recordings of this period had conga drummer Ray Barrretto in the line up and this recording is no exception and although this adds an added dimension after a while it becomes a little monotonous. The opening track Gene Ammon’s own “Twisting the Jug” is played at a steady clip with a rhythmic shuffle beat with McDuff playing long sustained notes, Joe Newman’s trumpet solo is nicely paced and full of ideas. Ellington’s over recorded “Satin Doll” turns out to be one of the best tracks of the session with Ammon’s interesting solo and Newman’s muted trumpet solo. The balance of the tracks on CD One find Ammon’s paired with Sonny Stitt with whom he has worked and recorded with on many occasions and is probably one of the known two tenor combinations. The most satisfying track from this session is the unlikely “When You Wish Upon A Star” on which both tenor players give a good account of themselves. Both tenor men are at their melodic best on the ballad “Out In The Cold Again” with Ammon’s just taking the honours. CD Two has a much different feel to it than the previous tracks on CD One, the drummer Joe Dukes approach is more percussive which in turn pushes Ammon’s to employ a harder sound. The guitar of Eddie Diehl is also added to the line up which gives the group an additional voice. Tenor man Harold Vick is also present and he has a lighter sound than Ammons but features mostly in the ensembles. The CD notes credit seven tracks to this personnel but on listening one of the bonus tracks “Sram” is also from this session and happens to be the most interesting tracks with it’s propulsive beat. 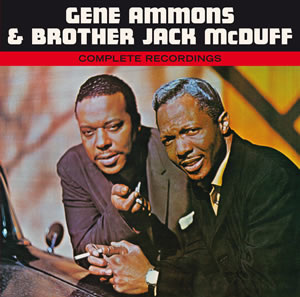 The other three tracks are without Brother Jack McDuff but have Pattie Bown on piano and have a completely feel to them with Ammons employing a much lighter touch. “The party’s Over” is nice lightly swinging number with some fine piano from Patti Bown who solos wel throughout the three tracks. These bonus tracks are a light relief after the previous tenor / organ numbers. If you enjoy the tenor and organ combination this may well be the album for you there is much of interest within these two CDs.